Good afternoon! Today I have some swatches of five new Naild'it Unique Nail Polish lacquers. I believe these are all included in the Spring Has Sprung Collection, and they all have that distinct "Naild'it flair." Let me know which ones you guys are liking at the end of the post! Peace, Love, and Hairspray is a whole lotta glitta! This mix, which is primarily black and white, is accented with glitters in every color as well as shapes like hearts and flowers. It's a fun explosion, basically, and not surprising that I am so super duper in love with it! This is just one coat over DIOSA Dime Piece. Sur Round Sound is a white based polish with loads of glitter. 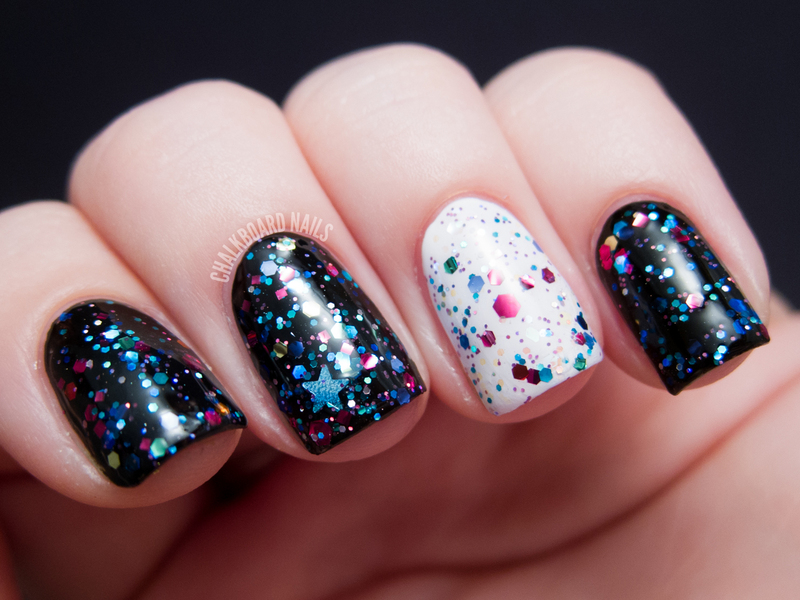 This polish is primarily made up of blue, pink, silver, and black dot glitters of various sizes, and they are accented by other smaller glitters. I love the finished look of this polish but found that some of the larger dot glitters sat a bit flat on my curved nails. Still though, how fun, right? I needed two coats for the opacity below, which was great for a white based polish and also kept the amount of glitter from being overwhelming. Spring Fling is a white based polish with a peppering of pretty glitters and a bunch of different shapes, including moons, flowers, and butterflies. It applied a little thick, and I was a bit disappointed to see that most of the shapes got pretty buried in the base. I think next time I wear it I may add a bit of thinner and perhaps start with a white base. I needed three coats for this swatch. Lilac Electra is unique to my collection -- I don't think I have anything else like it. I've layered one coat over China Glaze Tart-y For the Party here, but this could also be built up to opacity on its own. It's hard to describe. My best try would be: a coarse-grained faintly holographic lilac with iridescent and purple glitters. It's really quite cool! Here it is in direct light so you can see the little linear holo just barely peeking out. Confetti Falls is a gorgeous mix of jewel toned glitters like blues, teals, and magentas. There are also stars in the mix, which add just a bit of whimsy when they come out to play. Shown here over black and white. Definitely a winner. I'm predictably obsessed with Peace, Love, and Hairspray, but my other picks would be Confetti Falls and Lilac Electra. Which ones are you drooling over? In exciting news, Naild'it is in the process of transitioning to new bottles! There's a new logo as well as a new bottle shape. 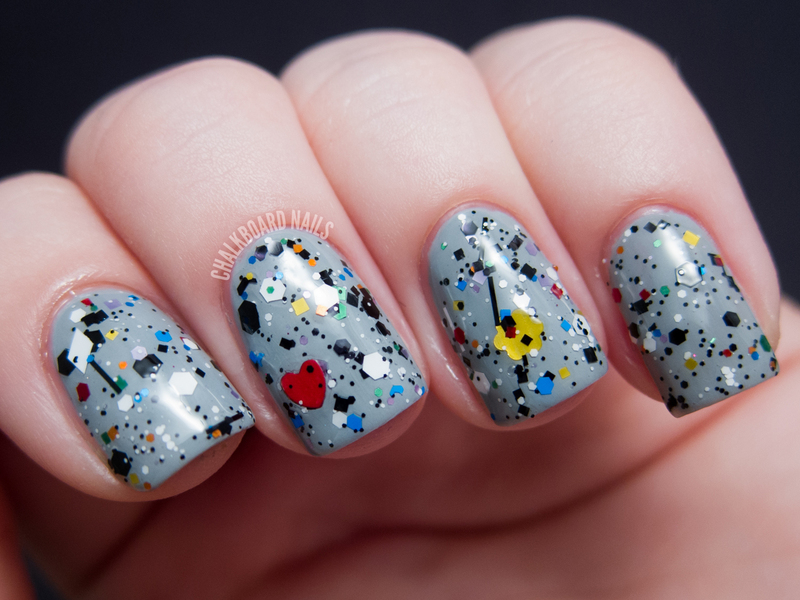 You can check out a photo of the design on the Naild'it FB page. Naild'it Unique Nail Polish is available on Etsy, though the shop is currently on vacation. In the meantime, you can shop the brand on Llarowe (the new collection that these polishes are a part of should be stocked tomorrow), Overall Beauty, and Mei Mei's Signatures. You can also keep up with the brand on Facebook. Products sent for review consideration. Oh my gosh Peace, Love, and Hairspray is awesome! Looks great over grey! Your swatches are beautiful as always! MY favourites are definitely Peace, Love and Hairspray andddd Confetti Falls! With your obsession with black and white glitter, I am not surprised you like Peace, Love and Hairspray!! Great swatches of really cool polishes! sur round sound is wonderful <3 I'm in love ! Beautiful! These polishes look lovely! Pretty polishes! I like Peace Love & Hairspray and Lilac Electra the best. Very cool swatches! Lovely! The confetti nails in the last pic are my favourite ones! Shamrocks, Rainbows, and Gold, Of Course!